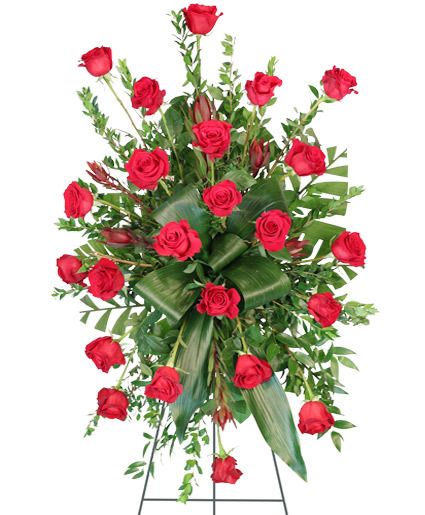 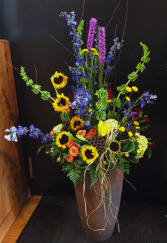 Easel, Large Wet Floral Foam Cage, Foliage: Myrtle, Aspidistra, Teepee, Salal, Red Roses, Safari Sunset Leucadendron. 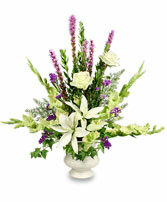 Acrylic Urn Container, Wet Floral Foam, Foliage: Myrtle, Ivy, Jade, Sprengeri, White Lilies, Green Roses (Jade), Purple Liatris, Green Gladiolus (California), Purple Statice. 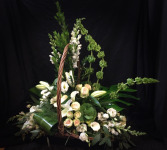 Arrangement is in a fire side basket with all white flowers.